Live Media webcasts consist of high quality video, audio, synchronized presentation slides and a chat feature. Click for a free quote, or call 416.802.5750 for a free consultation today! 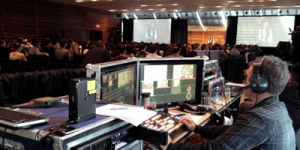 Need more information on webcasting? Click here. Need slides and audio, but no video? Try our Live Media Webinar Services. Looking for HD video and audio only? Try our Live Streaming Services. Looking for 2-way or multi-point communication with audio and video? Try our Live Media Video Conference Services. Looking for professional video recording? Try our Live Media Corporate Video services. Looking to record your mulit-session business conference? Try our Live Media Conference Recording services. High Quality Webcasting at Affordable Prices.